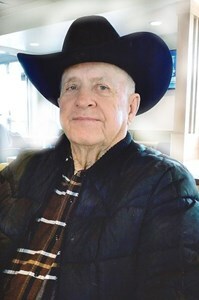 Gaylin Lee Anderson, 82, of Paola, passed away on April 12,2019 at his home. He was born on January 18,1937 to Lee and Minnie (Callaghan) Anderson in Brady, NE. Gaylin worked as a farmer/rancher in the early years of his life then decided to follow the Lord’s call into ministry. He studied at the Bear Valley School of Preaching and began his many years of Preaching the Word! Friends and family loved to listen to his stories of the adventures he had while ranching in the wilderness of Canada and breaking horses! He was still preaching until recently when his illness made him stop. On July 2, 2004, he married Barbara Marrow. Gaylin and Barbara lived in Paola, KS. Gaylin is survived by his loving wife, Barbara, and children from his previous marriage; Roger Anderson, Jeannie (Lee) Hite, Deanna (Troy) Sauers, Janet (James) Smith, 12 grandchildren and 17 great grandchildren! He was preceded in death by his parents and brother, Ivan Anderson. Visitation will be held Tuesday, April 16, 2019 from 6-8 PM at Penwell-Gabel Cremations, Funerals & Receptions, Olathe, KS. Funeral services will be held on Wednesday, April 17, at the 151st Street Church of Christ at 10:00AM. Add your memories to the guest book of Gaylin Anderson. I had fond memories of all of you when I was a little girl. I remember swimming in the horse trough and picking things in his garden. Uncle George and Gaylin were close friends as I remember. My sympathys to all the family. I'm hoping one or all of you will write to me at my email to catch up and share photos of Galin. I am Stanley Andersons daughter and went by Kayleen. There was Kathy, Michael, Victor and Karen. We are so sorry for your loss. We have so many fond memories of Gaylin . We especially remember the fun we had in our visits to Canada and helping move horses back. We will keep you in our prayers. Uncle Gaylin was my hero when I was young, come to think of it, he still is !! He could crack a blacksnake whip like nobody's business ! You will never find a more Godley cowboy than Gaylin! I would like to think that he is riding good horses an baling hay with our Lord ! Love you like a brother! You all are in our thoughts and prayers. My you find comfort knowing Gaylin is with our Lord and Savior. And that we'll all meet again.